The species is widespread across Wales and north-west England, and in upland areas of south-western England. It is absent throughout much of south-eastern England and Scotland. C. atropos has been recorded from France, Belgium, Denmark, Sweden (where it is included on their Red List (Gärdenfors 2000)), Germany, Switzerland, the Czech Republic, Poland, Hungary and Romania. It has not been recorded beyond Europe (Platnick 1998). 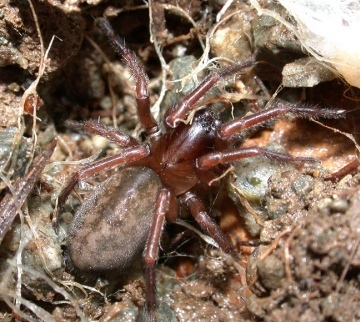 C. atropos constructs a silk-lined burrow beneath rocks and logs in woodland (broad-leaved and coniferous), moorland, heathland and mountains. In woodland sites C. atropos can also be found living arboreally in rot-holes (M. Askins, pers. comm.). Adults of both sexes have been recorded throughout the year, but males mainly in the autumn and winter, females in spring and early summer. Males are often found guarding females in their retreats. Single egg-sacs are produced between May and September and are affixed to a rock or log within the female's retreat. The resultant spiderlings may remain with their mother for the first few instars prior to dispersal. The spider is common in the west, becoming scarcer towards Scotland. It is very rare in south-eastern England.